The gutsy feature debut of young director Stephen Dunn, Closet Monster is a Canadian film that takes its inspiration from both Xavier Dolan and David Cronenberg. These fellow homegrown filmmakers couldn’t be further apart in their own work, but their influences are both felt in this self-assured and often ambitious first film, even if its reach somewhat exceeds its grasp. Comparisons to Xavier Dolan are warranted in the film’s stylish cinematography and open exploration of LGBT themes, not to mention the fact that it’s the work of a filmmaker who is still in his 20s, yet exudes confidence over his material. The influences of David Cronenberg are felt in the almost unexpectedly graphic moments of body horror that pop up throughout the film. The talking hamster voiced by Isabella Rossalini is entirely its own thing, so more on that in a moment. The film follows Oscar Madly (Connor Jessup), a Newfoundland teenager who is struggling to explore and confront his sexuality, while living under the close watch of his possessive and increasingly abusive father (Aaron Abrams). Oscar is emotionally scarred from having his mother (Joanne Kelly) leave when he was young, and from witnessing a horrific hate crime as a child, when he helplessly watched a gay teenager get beaten and sexually assaulted with a metal rod in a cemetery. When Oscar falls for the free spirited Wilder (Aliocha Schneider), a fellow employee at the hardware store where he works who openly enjoys the hedonistic pleasures of life, everything starts coming to a head. Further confusion over his sexuality comes from the fact that everyone assumes his best friend Gemma (Sofia Banzhaf) is also his girlfriend. Plagued with panic attacks, and visions of a rod bloodily piercing his stomach when he is confronted with any hint of sexual activity, Oscar’s dreams of moving away to college and studying to become a makeup artist for horror movies threaten to be derailed. The film takes its cues from any number of coming-of-age-and-coming-out stories, but it’s the approach to the material that makes it feel original. As I said earlier, Closet Monster mixes a variety of different tones, and this is a highly stylized film that is filled with many unique elements, ranging from dark visual metaphors to moments of fantasy. Some of these tonal shifts are affective, and others not so much. The film has bit of a weird juxtaposition between its more whimsical elements, like the talking pet hamster who constantly gives Oscar advice, and the frequently moodier moments when he has bloody flashbacks of the trauma he witnessed as a child. These almost gothic images do a fine job of inducing feelings of anxiety, but they can become tiring to watch, especially in the more graphic moments of body horror, which start to grow repetitive. While admirable on one level, the sharp tonal shifts between the whimsy of a talking hamster and the gory PTSD-induced hallucinations don’t always work, and can give the film an uneasy vibe that sometimes make it hard to feel like it fully comes together as a complete whole. But Closet Monster is a confident film, and that counts for something, especially in terms of a debut feature. The film is further held together by a solid performance from promising young actor Connor Jessup, who brings emotional weight to a character struggling to literally come out of both the mental and physical prisons that hold him back. 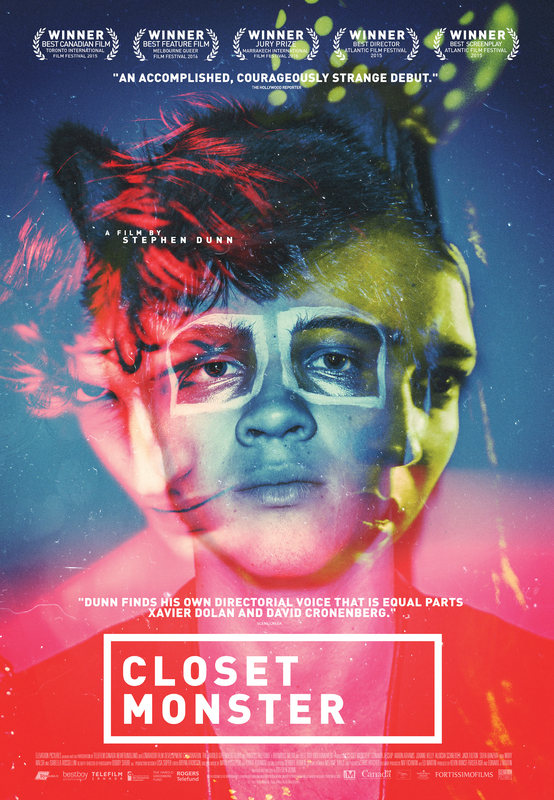 Although this is an almost uncompromisingly bleak coming of age drama, Closet Monster is still unique, engaging and moving enough to warrant a recommendation, and should especially connect to sympathetic teenaged audiences. Closet Monster is now playing in limited release at Cineplex Cinemas Varsity in Toronto, and will be expanding across Canada throughout the summer.